You may have heard of the bad news of “brain drain” during the three summer months that your children have for vacation from Parents magazine. As a former classroom teacher, literacy tutor and library-trained storyteller for children I can tell you that you do not need to panic. Disclosure: I have not received compensation of any kind to promote a company, brand, product or blog. Like my Anthropology Professor said, “You have all the right ingredients to be a teacher.” Most likely your children are learning from you already. How? They observe how you take care of your responsibilities, groom, eat, keep fit, recreate and make decisions. These leadership concepts are adapted from Leadership Challenge by Kouzes. It has proven useful to me during and after business school, at the office and when “edutaining” children. You may have heard the self-help idea of visualizing your destination and working backwards to take action daily to reach that goal. Similarly, you can create a summer objective and co-opt your children to join the “cause”. I’ve observed that children are surprisingly altruistic. Parents magazine confirms this also in the July issue. Some kids will go out of their way to soothe a crying peer. Likewise, you can create a vision of summer as making a positive impact on your neighborhood. How can learning to prevent summer brain drain benefit others? By applying what your children learn in volunteer projects that benefit your local community, church or nonprofit organization. 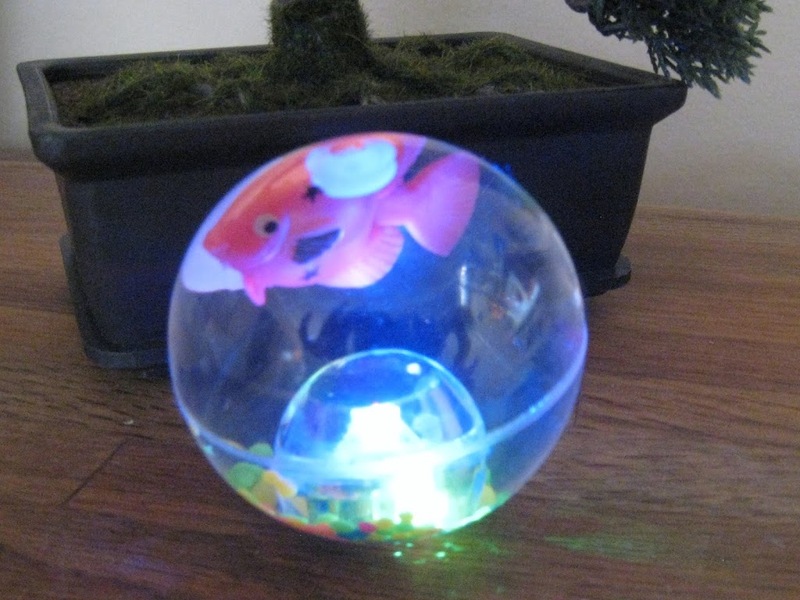 Be the first reader to contact me with your summer project based on this article and receive a mega-sized bouncy ball valued at $5. Of course, this will need to be something within your budget, fits your work schedule and is dear to your own heart. Will the vision to be to attract wildlife native to your neighborhood such as butterflies and birds to your backyard? Will it be to model how to use wisdom to make friends and care about your neighbor? Will your vision be to observe the science of plants growing in your local state parks? A vision is different from a mission statement. I recommend that you ditch the rigid idea of a summer mission statement because it is likely to be stifling to kids. A mission statement, as defined by business school must include S.M.A.R.T. It is a written goal that is simple, measurable, attainable, realistic and timely. I don’t think that fun learning can thrive in such rigid confines. Instead, expect your child to engage with you and participate with ideas of his/her own. Encourage what ifs. My husband is a children’s toy marketer and I am a former pro bono consultant for an educational children’s book publisher so our apartment often has juvenile library books and chidren’s educational toys for our research. 1. Mexican Folk Tales by Juliet Piggott. If your family has recently moved to Los Angeles, your child might be delighted to learn about non-European fairy tales. He or she is likely to hear the Spanish language spoken and might want to learn more about the heritage of his or her bilingual peers. 2. 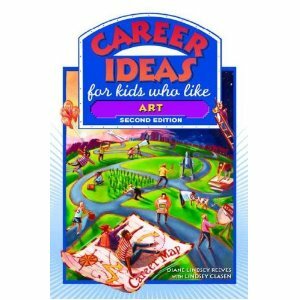 Career Ideas for Kids Who Like Art by Diane Lindsey Reeves. If your child is a fan of math and science, you can introduce him or her to more abstract thinking. Your child will be more emotionally resilient as an adult if he or she can imagine. Professor John Boe, my children’s literature professor researched the healing effects of storytelling for traumatized children. He volunteered at a psychiatric children’s hospital for young victims of violent crime. Art can restore wellness. Art can also encourage compassion and understanding in children who may be too literal. 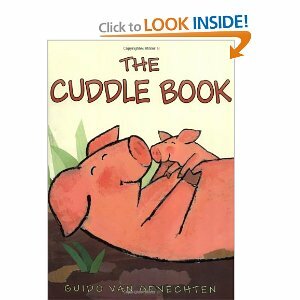 3.The Cuddle Book by Guido Van Genechten. For crabs cuddling can be tricky but your cuddlebug will enjoy imagining how “kid” animals hug their parents. 4. 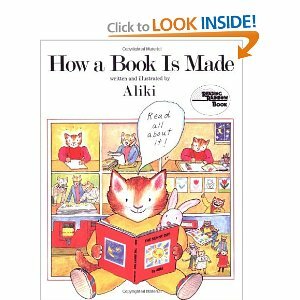 How a Book is Made by Aliki. Your child is likely to enjoy the drawings of cats as proofreaders. 5. Your Child at Play: Three to Five Years by Marilyn Segal, Ph.D. This is a nonfiction book meant for parents not as a read-aloud to children. 6. Mrs. Fields Best Ever Cookie Book. If your child has an aptitude for business, such as running a lemonade stand and closing sales he or she might be interested in this book for two reasons. She can study why Mrs. Fields’ business suffered bankruptcy and how her recipes can be updated for the 2012 diet. 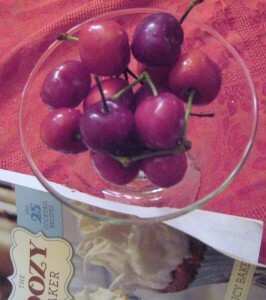 For instance, what recipes can be revamped and made organic, vegan, diabetic and gluten-free. 7. Toys! 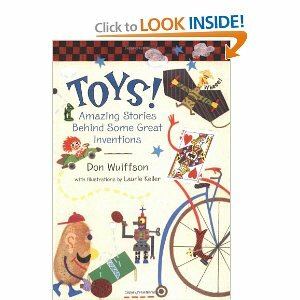 Amazing Stories Behind Some Great Inventions by Don Wulffson. Did you know that the bouncy ball helped name the Super Bowl? Fun facts and great stories of persistent inventors. Imagine how you and your child can apply such learning to improve your community. What if you and your child were to adapt Mrs. Fields’s recipes for a vegan bake sale? What if you made finger puppets together so that your child could do a storytelling performance with her slumber party guests? What if your son were to learn one Mexican folktale that he and his friends could write into a play? Such experiences create lasting learning. Happy Summer with Your Kids! It’s soon to be Father’s Day and I realize that I miss my Grandpa Paul and Dad Peter very much. Dad has been gone for four years. Grandpa Paul has been gone for more than a decade. 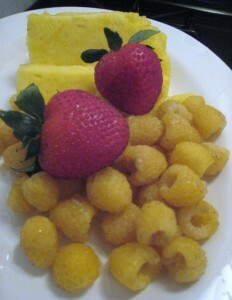 Certain childhood Chinese foods remind me of them. For example, it was a family tradition for Dad Peter to pack mom, my siblings and me into the minivan after church to visit his parents in Berkeley. Before stopping by the grandparents’ home Dad would make sure to buy Grandpa Paul’s favorite dim sum to bring in a large pink pastry box. Deep fried savory-sweets would be nestled together in white cupcake liners. Eventually, the paper box, wrapped with red string, would show darkened grease spots on the 20 minute ride from Oakland Chinatown to their home on Acton Street. Disclosure: I have not received payment to endorse any company, product, brand or blog. 2. Chinese Fruit Flavored Beef Jerky. What?! Yes, you heard that right. I remember going to Chinese supermarkets and finding boxes of vacuum sealed beef jerky next to the dried melon and lotus seeds. 3. Chinese Pork Floss. This is also a version of jerky. My Greatgrandmother on my mom’s side would make this in a wok by dry frying pork until it became dehydrated and easy to shred. 4.Black Sesame Pudding. When I read about gruel in German fairy tales I wondered if German children had sweet gruel the color of charcoal. 5. Chinese Dan Dan Noodles. This is close to spaghetti if it were seasoned with sweet chili sauce and covered with toasted peanuts. 6. Lo Dan Soy Sauce Eggs. I ate dyed hard-boiled eggs all year long not just during Easter. 7. Five Spice Soy Sauce Duck. I used to eat chilled duck wings like other kids enjoy buffalo wings. 8. 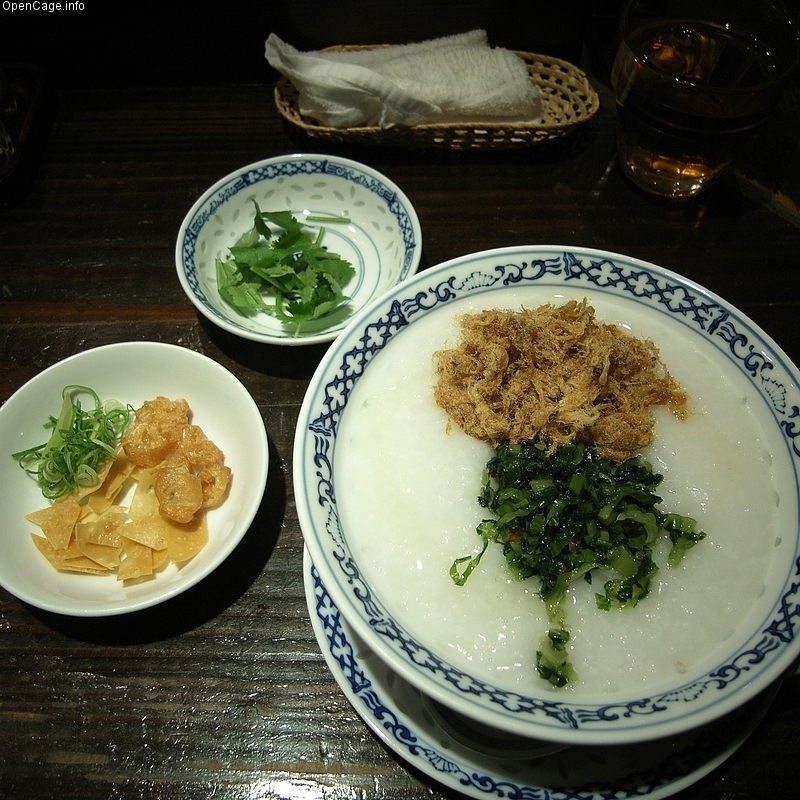 Rice Porridge. I like these Chinese breakfast rice soups with “century duck eggs”. 9. Siu Yuk Crispy Pork Belly. Better than bacon or crackin’. 10.Steamed Egg with Dried Scallops. This will change a picky eater’s mind. 11. Braised Beef with Daikon. Daikon was my favorite vegetable as a kid. It has a mild horseradish bite. 12. Pressed Tofu with Chinese Celery Stir Fry. Excellent vegan protein. 13.Salted Eggs. Salt-pickle eggs at home. Serve with steamed white rice or use in festival pastries. 14. Eggplant with Garlic Sauce. Great for winter meals with hot rice. 15. Hainanese Chicken. Pandan leaves are essential to this dish. 16. Ginger and Black Vinegar Dip for Crab. The only way to enjoy crab in the summer. 17. You Tiao Savory Chinese Crullers. Like savory beignets to eat with rice soup and green onions. 18. Braised Pork Belly with Preserved Mustard Cabbage. Easy to chew for toddlers. 19. Beef Chow Hor Fun. Soft, flat, rectangular rice noodles. A kid’s favorite. 20. Stir Fried Bitter Melon with Black Beans. Enduring a bitter flavor can be as exciting as a hot sauce eating contest. 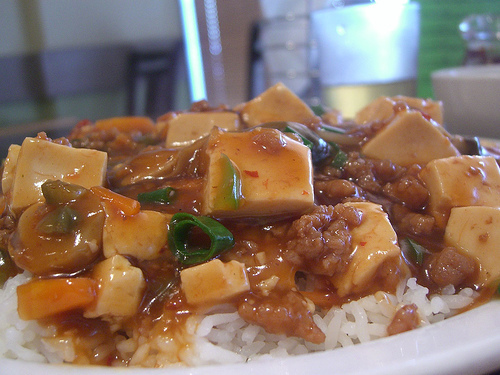 21.Mapo Tofu. Spicy tofu dish that kids love. 22. Har Gow Shrimp Dumplings. The #1 favorite of kids when visiting a dim sum restaurant. 23. 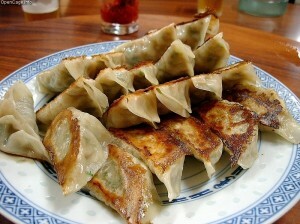 Ha Cheung Rice Rolls. 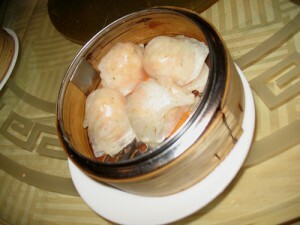 The #3 dim sum favorite. 24. Potstickers. Easy to hold for toddler hands. 25.Won Ton Noodle Soup. A mild and unintimidating introduction to Chinese food. Consider treating your dad or grandpa to his favorite Chinese restaurant for lunch on Father’s Day! 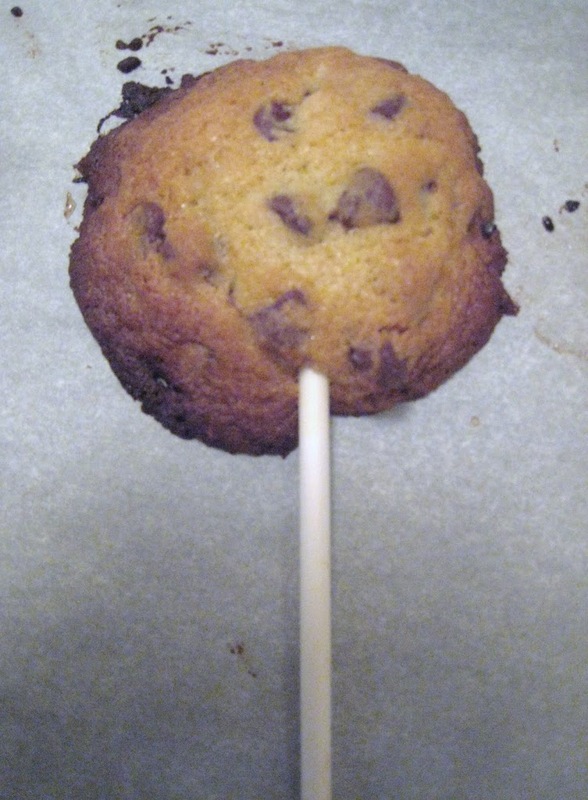 Will the spindly neck of the cookie lollipop stick hold the enormous “sunflower-sized” chocolate chip cookie? 1. 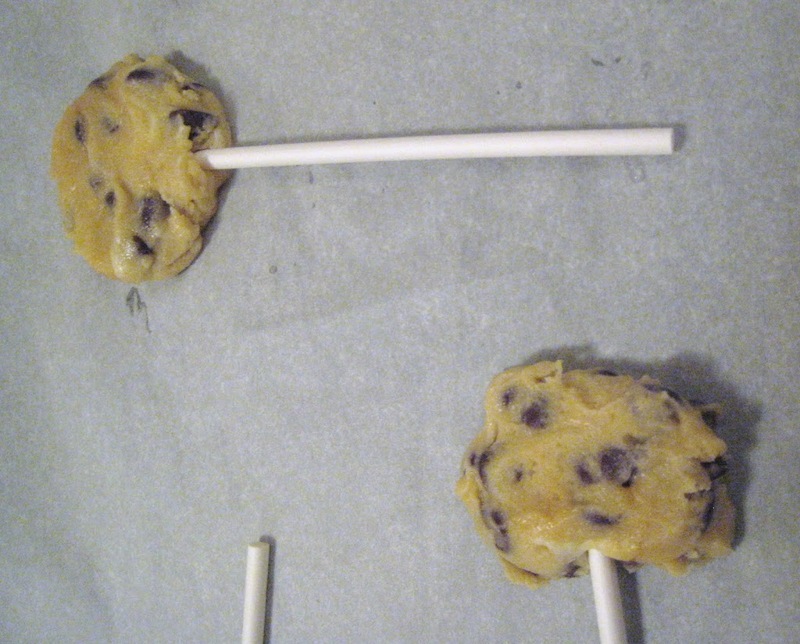 Cookie integrity-the crispness of the cookie dough ingredients will determine how transparent, lacy or opaque the “face” of the cookie lollipop. If the ingredient lists has more shortening in it, the cookie is likely to spread and display more lacey holes. As a result the lollipop stick will be less stable because it will have less to hold onto. If the list of ingredients has more dry ingredients than fat or moisture, the cookie lollipop may have excellent integrity but be more decorative than edible. 2. Cookie Lollipop Storage-Do you need to keep your bake sale item chilled below 40 degrees Fahrenheit? Must it stay out of the sun to avoiding icing or chocolate meltdown? Follow food safety rules when deciding on cellophane bags and upright or horizontal merchandising displays. Keep attractiveness in mind but food safety is first such as protecting food items from insects, storing bake sale items 3′ off ground level, and individual wrapping of each baked good for hygiene. 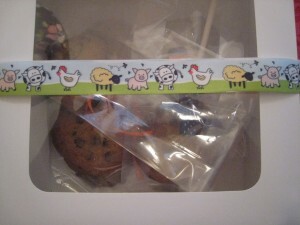 3.Cookie Lollipop Packaging-Does your cookie booth capture the interest of food trend followers? If you use organic ingredients, do you label each sale item? Do you use gluten-free flour? Are you offering a vegan alternative? How do you stand apart from the crowd? Don’t be shy! This is healthy competition to raise the most for charity. Use a bit of showmanship borrowed from cookie packaging best practices. That’s why I am practicing 5 days in advance for the bake sale. Cooling times vary. 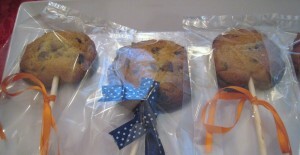 Should cookies be cooled for 30 minutes or up to 2 hours before storing and packaging? Can such cooled, freshly-baked cookies be frozen? How much lead time will the bake sale volunteer need between baking to “showtime” at the sales booth? Cookie lollipop storage and display test runs take time. What happens on a dry, cool day of baking can be very different from a hot, humid day at the display booth. 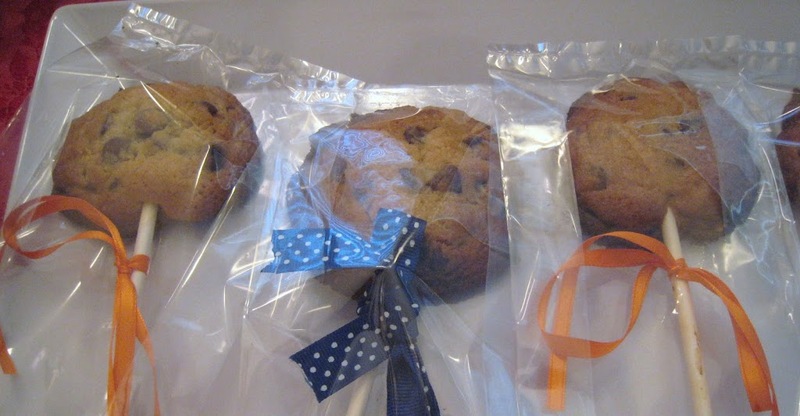 Will your protective plastic storage cause the cookies to sweat and lose their integrity. Integrity, here, refers to how well the cookie pop stays together? 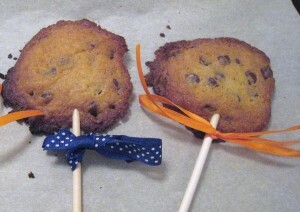 Losing crispness can cause the cookie lollipop to break apart. Focus group assessment. 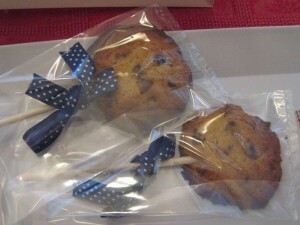 How do the cookie lollipops taste? Does the packaging appeal the the demographic? How does it measure up to the competition on “game day”? Get discriminating volunteers who are not afraid to tell you where your baked goods can use improvement. If you have more than 5 days, you can even use data collection software such as Survey Monkey. Visit again for best practices regarding survey creation and selecting focus groups. I admire scout troup leader moms and full-time stay-at-home moms. I’m not one of them so I am uncertain when a cookie lollipop tutorial might be missing a step such as reinforcing cookie pops with floral wire for display or adding some type of edible cookie cement to the structure. When I was a Brownie Girl Scout I was in awe of the moms of other girls who were adept at making candy melt pops in the shapes of pigs and other farm animals. I’m grateful that my mom, though she didn’t have time to volunteer as a den mom, she enrolled me in the scouts to learn some domestic and wilderness survival skills. As you might recall from my post about European Desserts, my mom grew up without an oven so baked goods were foreign to her. 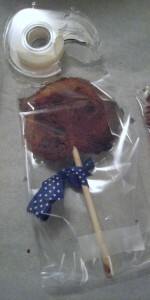 So I do not fault her for considering dipped pretzels, 3D teddy bear cake molds and cookie lollipops a mystery. 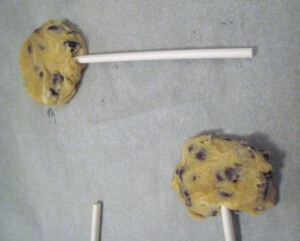 I’ve noticed that the majority of cookie lollipops on food blogs and Pinterest use a sugar cookie dough recipe as opposed to a chocolate chip base. Is it because chocolate chip cookie recipes have too little flour and too much semi-solid fat to hold together as a cookie lollipop? Despite this challenge, I have my heart set on chocolate chip studded cookie lollipops to fit my bake sale booth’s theme: “cookies for boys”. You’ll understand why I’m doing this cookie lollipop experiment with these requirements when you skip over to “Bake Sale Tips and Tricks” and read the process of elimination for marketing and packaging of baked goods. Qualitative and quantitative surveys and statistical analysis were my favorite parts of consumer behavior marketing class in business school. When you think of linzertorte do you imagine a lattice top or a crumbly dessert bar? 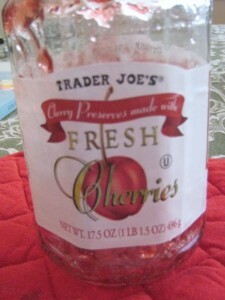 Do you envision seeded raspberry jam or whole cherry preserves? Toasted walnuts or ground almonds? Ever since I purchased The Boozy Baker by Lucy Baker at the Blue Wave car wash this winter, I have been experimenting with different jams. In spring, I used homemade plum jam sent by a girlfriend. I’ve also combined jars of Trader Joe’s raspberry, apricot/peach and cherry preserves for the dessert I brought to a different girlfriend’s bon voyage party. Now that it’s summer, I’m thinking about uniform cherry preserves but maybe switching the almonds to pistachios, macadamias or pecans. I have not tried substituting almonds for walnuts as suggested by the Betty Crocker Linzertorte recipe. I’ve also seen whole hazlenuts at Trader Joe’s but I’m not ready to misuse my Osterizer blender to grind nuts. I need it to make peach pineapple soy smoothies for my hubster. What is one piece of kitchen equipment that has failed me in four years of marriage? When my husband let me buy a mini chopper/wimpy food processor during our first year of marriage, I was only able to make two batches of crushed cookie and ground nut rum balls before the machine died on me. I won’t name the brand but I was so dissappointed. That’s why I purchase pre-ground nuts in bulk from Sprouts or Trader Joe’s. I am proud to say that I toast them in a dry skillet, though. What has been the only variation that did not turn out well? When I increased the rum to two capfuls instead of a single capful, the texture became tough instead of buttery. The sweetness also became overpowering. 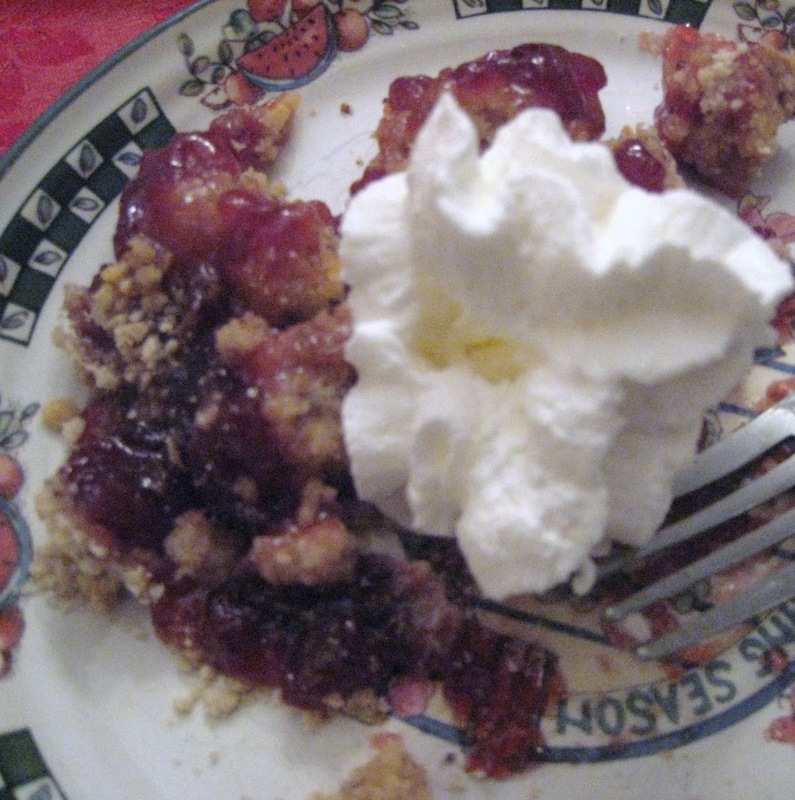 Lucy Baker’s original linzertorte recipe recommends strawberry preservers with port. I haven’t tried that yet because I’m not a fan of port. Rum seems to be versatile enough to use in chocolate chip cookies and other recipes that call for vanilla extract. That’s when I usually swap out the flavoring for dark rum. What about a lattice crust? Sadly, it has taken me more than 25 years to perfect homemade cinnamon rolls and pie crusts are likely to take just as many years of practice. Although Lucy Baker and Betty Crocker give simple, straightforward instructions, I have been unsuccessful at creating lattice crusts. Contact me if you know of a revolutionary way do achieve this. What is my fascination with baked goods? I credit The Brothers Grimm for their Hansel and Gretel, original German fairytale. How can desserts be so good that they become deadly? If you had powerful magic, would you live in a woods in a house made entirely of cookies? Would it cause you to lose your eyesight and become a cannibal? My favorite version of Hansel and Gretel has actors Ricky Schroeder and Joan Collins. It was a Platypus production by Faerie Tale Theatre by Shelly Duvall. 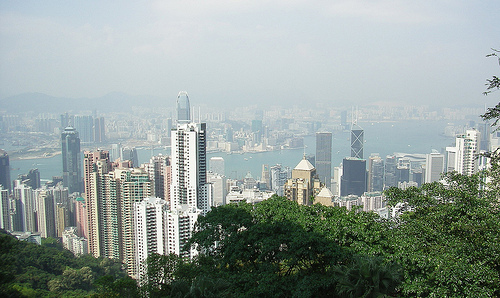 My mom and dad would tell me of a faraway land called Hong Kong where people lived in high rise buildings and could go a week without seeing the sky. They had school in the same building a few floors down. As a child in America I liked fresh air and running in the park so much that this was unthinkable. It caused me claustrophobia just imagining such a life. Worst of all, in Hong Kong apartments, when my parents were children there weren’t any full-sized ovens. This is the story that made me scream. That is the most frightening thought. This meant that desserts were steamed, boiled, fried or chilled. I shuddered. My parents never knew what it was like to sit for 12 minutes and watch chocolate chip dough crisp, bubble, brown and rise. I continue to read of brave children, European forests and to-die-for desserts well into adulthood. I pursued German language and culture in high school. Eventually I married my very own German American after college. He was the right man for me because he took me to Austrian pastry shops when we dated. He does children’s toy marketing as a career and I continue to bake as a hobby.